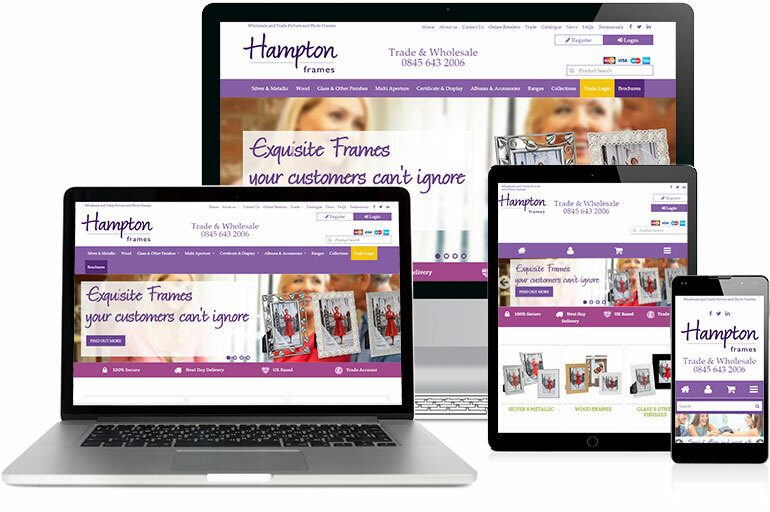 A new client to Freetimers in 2016, Hampton Frames is a thriving £multi-million turnover designer and wholesaler of quality picture, photo and commecial certificate frames, with multiple websites and substantial multi-channel operations including with Ebay and Amazon. A relatively new business they have seen substantial growth over the last couple of years, and have found that their existing websites were not up to the mark. Further, the management systems linked to the websites were also increasingly not keeping pace with growth, and were incapable of being able to expand or integrate as required. They found in Freetimers a new partner who could update their websites, enhance their branding and online presentation, and who could provide a fully integratable multi-channel business system, which could be tailored to their growing and changing needs. They also needed a more substantial partner who could contribute to their busness' growth strategy and provide on-going support in marketing, design and programming to help them manage growth far into the future. 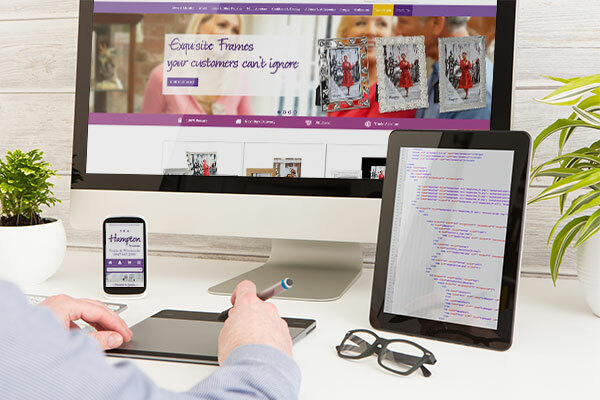 Our initial brief was to produce a new high quality fully responsive ecommerce website targeted at their main trade customers at hamptoframes.com. Keeping but enhancing their current branding, we were also to establish an online CMS and business administration system which was to be multi-site and multi-channel capable, so it would be ready for subsequent integrations of their Amazon and Ebay operations, as well as further websites, with the goal to streamline their order and inventory management, improving quality and saving huge amounts of time by having everything managed via a single shared environment. The main site was also to have a much glossier design to reflect their positioning at the higher quality end of their market. The trade site would show products but prices only on login. A client area was established to facilitate this, with the trade pricing and discounting system expanded to allow for tailored pricing arrangements for each of their retail customers. Clients would also be able to review orders/invoices and make payments against these specifically or on account. The site was also to be fully SEO-ready, with systems available to accommodate advanced SEO from the outset. We started the project with a series of kick-off meetings and then produced a number of initial design concepts for the new site's homepage. This was to have manageable full-size banners, product search, fully managable menus, category picture entry points, client login, featured collections, best sellers and special offers. Newsletter signup, account application and news/Twitter feeds were also included to ensure fresh content (important for SEO). The homepage concept was agreed, and this was followed by further bespoke designs for key pages such as for product categories, detailed product, the checkout/basket system, the client area, as well as concepts exploring the presentation on mobile devices. With the designs agreed, the website was then constructed by our in-house team of developers and programmers. Progress meetings were also held and a close dialogue maintaing with the client throughout and after the project completion. Our multi-channel management and CMS system was also deployed and programmed, with considerable customisation undertaken to ensure it could manage some quite complex product display and pricing requirements. The Hampton Frames website project commenced in March 2016 and completed its initial phase in July, with the new website and admin system going live after four months. Once the multi-site/multi-channel system was in place, and whilst still doing Phase 1, we were also able to start Phase 2 which included the development of another ecommerce responsive website targeted at a different market, which went live in Novemeber 2016. Further developments are about to commence and will include Ebay integration and linking the whole system to their Sage 200 accounting system.